Home / Uncategories / Former PDP National Chairman Dr Haliru Bello Loses Son To A Jealous Wife Who Stabs Him To death. Former PDP National Chairman Dr Haliru Bello Loses Son To A Jealous Wife Who Stabs Him To death. The police are probing the stabbing to death of Bilyamin Muhammed Bello by his wife, Maryam, in Abuja. Bilyamin is a son of a former National Chairman of the Peoples Democratic Party (PDP) and one-time minister, Dr. Haliru Bello. His wife, who is the suspect, is a daughter of former Aso Savings boss Hajia Maimuna Aliyu. Hajia Aliyu was recently nominated into the board of the Independent Corrupt Practices and other Related Offences Commission (ICPC). The couple before the weekend tragic incident had a one-year old daughter. “The FCT Police Command has commenced investigation into the matter. “The case has been transferred to the Homicide Section for discreet investigation,” spokesman Anjuguri Manzah stated in a text message last night. Clinging to her seven-month old baby girl, Maryam, who looked remorseful, burst into tears after being led into the flat where she allegedly killed her husband. According to sources, the jealous wife was uncomfortable with the text messages her late husband had been receiving from some women. It was gathered that a particular message from a banker made the wife to attack her husband. The source added: “They were at home when the wife became berserk over some text messages, including one allegedly suspected to be from a female banker. “After engaging in a shouting match, the wife was embroiled in fighting with her husband before heading to the kitchen where she picked a knife to stab Bilyamin three times, including on his private parts. “Drenched with blood, Bilyamin fought hard by crawling out of the couple’s flat to ask for help from neighbours. “Upon hearing his distress call, neighbours, who had heard the exchange of words and banging of doors at the flat, ferried Bilyamin to a hospital. Maryam is a graduate with two degrees from British university. In a Whatsapp message yesterday afternoon, her mother Hajia Aliyu expressed shock and feeling of loss over the sad development. “It is with a heavy heart but with total submission to the will of Allah that I announce the death of my son in-law, Bilyamin Bello Haliru, which sad event took place in the early hours of today. “May Allah grant his soul Aljannah Firdaus as his permanent place of abode,” the grieving mother in-law stated. 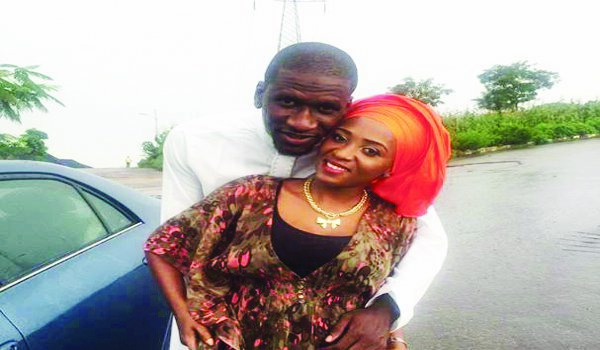 There had been whispers of a rocky relationship in a marriage meant to bring two prominent families together but allegations of infidelity and plans to marry another wife might have caused the insecurity in Bilyamin’s Maitama home. The patriarch of the family, Bello, is said to be away in the United States for medical attention. “We were all sad, it was just too heavy for us to break the news to our father,” a family source added. Source: Nation Newspapers.